Print your logo onto these custom printed mia magnetic phone holders or one of our other innovative electronic gadgets and use them in your next marketing campaign as a unique giveaway item. Mia Magnet Phone Holder could easily and securely hold your phone while in a car. The mount has 4 built-in magnets and clip it into air vent. Mia has a metal plate that sticks on the back of your phone and the phone magnetically connects to the mount. These are a handy phone accessory that look great branded. Colours: Black, Green, Red, Blue, White. Branding: Pad Print: 19mm Dia. 1 color only. Custom brand these escape led book lights or one of our best-selling promotional electronic gadgets with your company logo! Personalize your mia magnetic phone holders or custom design electronic gadgets for your marketing campaign. How can these unique promotional mia magnetic phone holders or our personalized electronic gadgets fit in with your marketing strategy and help you maximize your brand exposure? Our custom made Mia Magnetic Phone Holders can be produced from a minimum quantity of 100 pieces. 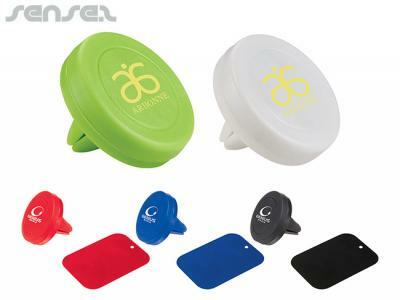 We can have your logo branded on these corporate Mia Magnetic Phone Holders in 1 Colour Pad Print. A setup fee of US$126.00 will apply to make the film.